Montana based singer/songwriter Ben Bullington died on November 18, 2013. They say you can learn a lot about a man when the responses to his death start rolling in. I certainly learned a lot about the impact that Ben had on so many. Ben was a small town family doctor until his pancreatic cancer diagnosis in November, 2012. He immediately stopped practicing medicine and embraced the last year of his life with a determination to make as much music for as many people as he could. Ben and I performed at festivals in Florida, Tennessee, Texas and Montana and Ben took road trips through the West Coast, the South, along the East Coast and included his hometown of Roanoke, VA. He played theatres and clubs and bookstores and roadhouses. He played to five people and to thousands, with a grin on his face the whole time. His last show was at the Elks Club in Livingston, Montana, his adopted hometown. His friend, accomplished author Maryanne Vollers writes about that night in the Montana Quarterly Dec, 2013 issue. Find it here: www.themontanaquarterly.com. In between, he touched so many. He leaves behind three sons – Samuel, Joseph and Ben. His CD’s will remain available and proceeds will go to the boys and I, so I can keep his music alive. I feel remarkably lucky to have been given the opportunity to ride shotgun on such an extraordinary journey with my dear friend Ben. 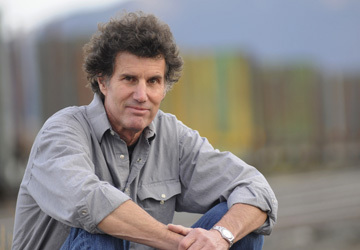 Ben Bullington, 58, a country doctor and singer-songwriter whose work drew a passionate following from the small towns of Montana to the music halls of Nashville, died on November 18, 2013, from pancreatic cancer at the Livingston, MT, home of his manager and close friend, Joanne Gardner, surrounded by his sons, Samuel, Joseph, and Ben, and his daughter-in-law Lorinda. He spent his last days in a room awash in items that reflected a keen and complex mind. Among them: his beloved 1929 Martin guitar, a blizzard of to-do lists ("lift-tickets for the boys"), concert posters, atlases, works by Robert Frost and the Sufi poet, Hafiz, and The Complete Calvin and Hobbes. After being diagnosed with terminal cancer a year earlier, Dr. Bullington retired from his job at the 25-bed hospital in Big Timber, MT, to spend as much time as possible with his family, and to make as much music as he could for as long as he could. During that year he kept up a solid schedule of touring between chemo treatments, playing music festivals from Florida to Texas to Tennessee, topping it off with his third appearance at Red Ants Pants, Montana's answer to Woodstock. He also collaborated with some of America's greatest recording artists, such as Rodney Crowell, Bill Payne, Mary Chapin Carpenter, Tracy Nelson and Will Kimbrough, to create his fifth CD, Ben Bullington. 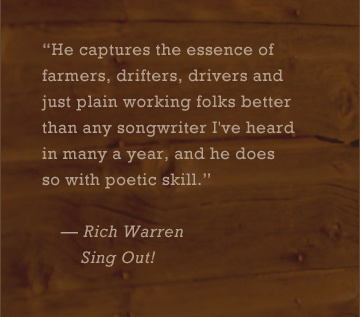 It flows like a musical memoir, filled with lyrical, exquisitely detailed and subtly political songs about love and loss and redemption (and flies, which he despised). Ben had decided his gravestone should read, "He loved words, guitars and wide open spaces," but characteristically, he wanted to take some time to think it over. His life was an unending search for just the right word. Benjamin Parrott Bullington was born on September 2, 1955, in Annapolis, MD, the middle of five children of Norwood William Bullington and Mary Wise Parrott Bullington. His father was a Naval officer who became a stockbroker in the small city of Roanoke, VA.
Ben was a sophomore in high school when he bought his first guitar, a Kent, for $20. He started taking lessons and trading for better and better guitars (a habit that stuck with him all his life). The first time he heard a Doc Watson record, he was hooked. The music "went right through the middle of me," he said. Ben went to college at Vanderbilt University, mainly because it was in Nashville. He soaked up the music scene that gave birth to the careers of songwriting legends like Guy Clark, Rodney Crowell, Steve Earle and Townes Van Zandt. But Ben left performing to the professionals while he studied for a geology degree. After college Bullington worked in the oil fields of North Dakota, the Northern Rockies and the Texas panhandle before reaching the end of that trail up a river in the Amazon of central Brazil, when he decided to go into medicine. "I was pretty good with science and liked working with people so I figured I'd put the two together." Music was still on the back burner through medical school at the University of Virginia, and stayed there while he started a family and practiced medicine on the Northern Cheyenne reservation in Montana, a small coastal Alaska town, in the mountains of West Virginia, and finally back in Montana. In 1996 Ben took a job at the small hospital in White Sulphur Springs, MT, pop. 965, and, with his boys getting older, he started writing songs in the quiet early morning hours. Those sessions filled up Bullington's first CD, Two Lane Highway (2007), produced by Sean Devine of Livingston, MT. The next four albums followed in quick succession: White Sulphur Springs (2008), Satisfaction Garage (2010), Lazy Moon (2012), and Ben Bullington (2013). Ben Bullington is survived by his sons Samuel T.(Lorinda) Bullington of Missoula; Joseph W. Bullington of Helena; and Ben A. Bullington of Helena; his brothers and sisters, Andrew Williams (Cary Hazlegrove) Bullington of Nantucket, MA; Mary Boxley Bullington of Roanoke, VA; Elizabeth Bullington (Samuel) Carlton of Charleston, SC; and Charles Carter (Ginger) Bullington of Roanoke, VA; and his beloved nieces and nephews. He was preceded in death by both parents. His marriage to Debra Triplett Bullington ended in divorce but they remained partners in raising their sons. In the final weeks of his illness, Ben Bullington was visited regularly by the loyal band of nurses he'd worked with in White Sulphur Springs. Up to his last morning, he was exchanging texts with musician friends and checking proofs for the reissue of several of his older CDs. His friend Rodney Crowell, the iconic American singer and songwriter, said of Ben, "Back in the early seventies we were all writing songs for the purest of reasons. And there was Townes Van Zandt showing us what to do. Then along came Ben Bullington reminding us of why we do this. That's the gift we were given."